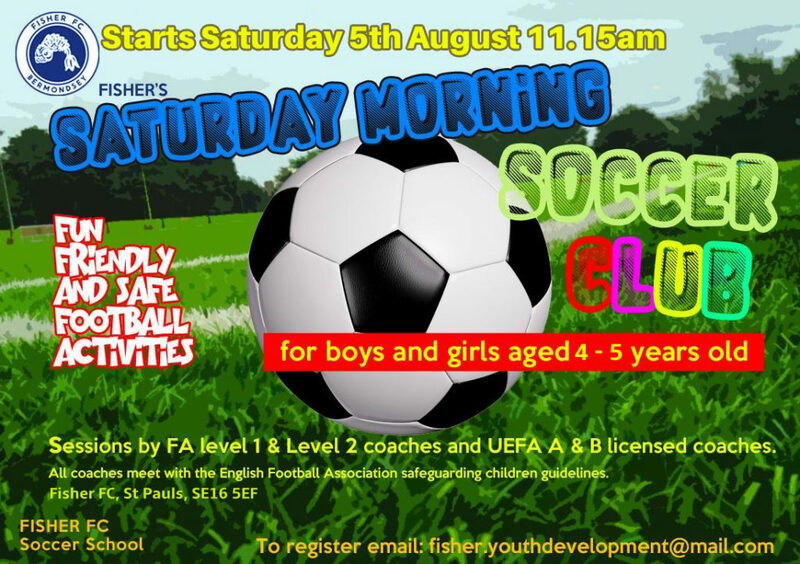 Fisher FC are committed to be an integral part of the local community and as such we are introducing a Saturday Morning Club for local kids to come down to St Paul’s to get them involved in footballing activities. Not only is it a chance for youngsters to be part of an organised footballing environment it’s a fun and healthy way to get fit and enjoy sport in a safe and friendly atmosphere. The Saturday Morning Soccer Club is for boys and girls aged 4-5 years old. The aim is to introduce young children to the game of football through fun football orientated games. The sessions will be delivered by FA level 1 and Level 2 coaches and UEFA A and B licensed coaches. All coaches meet with the English Football Association safeguarding children guidelines. If you are interested in your children having fun in a safe environment then why not give our Saturday Morning Soccer Club a try. The first session is on Saturday 5th August at 11.15am, so make sure you’re registered. We look forward to seeing you down at St Paul’s.